A tiny heart bead charm slides along a dainty link chain. The bead comes in Sterling silver or 24k Gold plated satin bronze heart. The chains come in 16" or 18" sterling silver or 14k gold filled link. 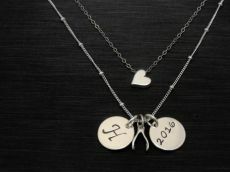 These necklaces look great alone or layered with another necklace.